There was nothing held in reservation when Dylan attacked. No restraint and no holding back. He fell on the guards like an enraged animal, each and every one of his strikes driven by the force of his fury. First, Dylan immediately charged the two guards closest to him. Grabbing them both by the neck, he slammed them into the wall with all of his might, hard enough to leave cracks in it. As the rest of the guards looked on, too surprised to make a move, Dylan snatched his katana off of his back, and in one lightning quick stroke cut their very heads from their bodies, splattering the surrounding area in the golden blood of the lightor. He turned around, only to be met by a barrage of blasterfire. He dodged most of it, but five of the blasterbolts managed to strike his chest. It didn’t matter to him though. As they fired, he sprang forward, attacking with a violent frenzy. As one Lightor guard met his charge with a blade of his own, Dylan parried his strike, and kicked him hard in the abdomen, sending him flying across the room, much to the astonishment of the other guards. Spinning around to meet two guards coming in on his left flank, Dylan unleashed a lightning quick flurry of vicious stabs and slashes, dismembering both of the guards in a couple of seconds before turning around and leaping into the crowd of the remaining guards, hewing of the arms of one of them before stabbing his blade through their chest. Regrouping with a new strategy, the seven remaining guards surrounded him and pounced on him from every side at once. Dylan thrashed around, punching and kicking at the guards, but there were too many of them. Soon he was almost completely immobilized and restrained, with the Lightor practically piling on him. Frustration began to fester in Dylan. Anger that he had come so far only to fail. Anger that after all of his efforts, he would just end up a prisoner like Shorya, or dead. That anger turned into fury, that fury turned into blinding rage, that rage turned into hatred. With a primal scream, Dylan thrust his arms out, and every Lightor soldier in the room went flying, their bodies slamming into the wall hard enough to leave cracks. And then, Dylan collapsed to the ground and faded into unconsciousness. Dylan’s still alive! Shorya’s heart had practically done a backflip when she saw him standing in the doorway. This was the first time Shorya had been truly happy since Dylan had given her that stone. For the past couple of days, Shorya had felt immense guilt and despair at the death of her best friend. Seeing him alive made her happier than she had ever thought possible. Shorya had watched, helpless as Dylan cut down almost half of the guards in an attempt to liberate her, before being tackled by the remaining seven guards. And then, something inexplicable happened. Dylan had somehow sent all the guards flying away from him before passing out and collapsing on the ground. Three of the guards had been impaled by the weapons that had been sent flying with them, and two of the guards lay unmoving on the ground after striking the walls particularly hard. Though which of those five guards were actually dead, and which of them were just unconscious was unknown to Shorya. The two conscious guards however were already back on their feet, one of them clutching at his injured side, and the other bending over to grab an automatic blaster rifle. They were going to kill Dylan! Shorya realized. Desperately, she tried to break free, pulling and yanking on her restraints, but it was no use. Her restraints wouldn’t even budge. The guard stood up straight and raised his arm, taking aim at Dylan as the other soldier walked over beside him, surveying the scene before him with great interest and pleasure. Unless Shorya did something soon, they were going to kill Dylan, and they were going to enjoy themselves while doing it. The thought of the sadistic pleasure these two guards would get from killing her best friend made her blood boil. Shorya closed her eyes, and pulled on her shackles as hard as she could, only this time, she did not give up. She kept pulling and pulling, driven by fear and anger. Dylan was her friend, her best friend, and she was not going to let him die like this. She pulled harder and harder, letting her desperation drive her forwards. The shackles were cutting into her wrists at this point, but she pressed on. She had watch Dylan “die” for her once before, she wasn’t about to go through all of that again. Shorya screamed, and in her scream was a mix of fear, desperation, anger and hatred. Shorya pulled one last time with all of her might, and the shackles around her hands snapped like twigs. Without thinking, Shorya reached down, and tore apart her leg restraints as well. Just as the armed guard began to turn his head in her direction, she was already in motion. In a flash, she snatched the sword of one of the fallen guards off of the ground and stabbed it upward, driving it straight through the bottom of the armed guard’s jaw and out the top of his head. The other guard was helpless to do anything as Shorya plucked the automatic blaster from the dead guard’s hands and fired a barrage of blasterbolts all over his body. Shorya didn’t let up, immediately after the second guard stopped twitching, Shorya kept her finger on the trigger and swept the blaster around the room, firing torrent after torrent of blasterfire into the fallen Lightor soldiers, ensuring that they could never get up to harm her or Dylan ever again. As soon as Shorya was satisfied that they were all dead, she immediately dropped both of her weapons to the ground and ran over to Dylan’s unconscious body. She dropped to her knees, and wrapped her arms around him, pulling his head up towards her. “Dylan!” she yelled, hoping he would awaken. Cradling his body in her arms, she closed her eyes as they began to tear up, hoping desperately for him to wake up. As if to answer her silent prayer, she felt his body began to move on its own accord. She opened her eyes a second before Dylan’s eyes fluttered open. As soon as their eyes locked, Shorya expected him to say something, but instead, he leaned forwards and wrapped his arms around her as well, embracing her just as tightly as she was embracing him. They stayed in that position for a few seconds, hugging each other as tears of joy rolled down both of their cheeks. The moment was interrupted when Shorya heard the sound of a comlink beeping. She saw Dylan snap back into focus and hold a comlink up to his ear. She was so close to Dylan that she could hear everything being said on his comlink. As soon as he put down the comlink, he turned to Shorya, and placed his hand on his temple, rubbing it. “What happened just now,” he asked, his voice weary. “How rude of them,” Shorya joked, a grin very similar to Dylan’s own spreading wide across her face as she reached into his jacked and grabbed a health stim. She then injected it into his chest. Dylan had led Shorya across the base, and they had cut down or shot down any Lightor they had come across who stood in their way. They were only a couple of minutes away from their ship now. Ever since Dylan had woken up and found himself reunited with Shorya, his bloodlust had subsided, though he wasn’t entirely sure if it was a good or bad thing. On one hand, his thoughts were definitely much clearer, and he was far happier now that he and Shorya were reunited. Still though, he couldn’t help but find himself drawn to and intrigued by the raw passion he had felt in those moments of his bloodlust. He felt a greater drive than he ever had in his life, and he felt more power than he had ever known. He quickly brushed that thought to the side, deciding to make the best of things, especially since he was reunited with Shorya. Right now he was content in reveling in his happiness and Shorya’s, he could always dream about power another time. “Thank you by the way for saving my life,” Dylan said as he and Shorya turned another corner. Best friend… Dylan thought to himself. So that’s all I am to her. Quickly he shook his head. Oh stop it! Dylan chided himself. Her friendship on its own is an amazing treasure. And how can you expect her to be honest with you about her feelings for you when you won’t even share your feelings with her. Dylan briefly pondered the manner in which he was having a conversation inside of his head. He wondered what it would be like if somebody developed two personalities so distinctly different that they somehow separated from each other. Perhaps one personality inhabiting the body, with the other personality flying around as a ghost or something. That’s the most retarded idea ever! Dylan thought to himself, almost laughing out loud at the thought of it. To him, the idea actually seemed like something a designer of one of the many video games Fernin played would do to a beloved character, perhaps just to milk them for more money. Fernin… One of the many people Dylan couldn’t wait to see, along with his squad, his parents, and Tormax. He wanted to go blaze with Tormax. He wanted to spend some time with his parents after being away from home for so long. He wanted to slam some alcohol with Fernin. And he wanted to properly celebrate his being alive with the rest of his squad. It was then that he realized that his birthday was actually approaching in little more than a week. Now he really wanted to get back home. It was then that Dylan and Shorya turned one last corner and found the door leading to the landing pad where Vu had left his ship. “Our escape vessel lies just beyond this door,” Dylan said to Shorya as they approached it. Dylan pressed the button on the stolen control panel fastened to his arm. 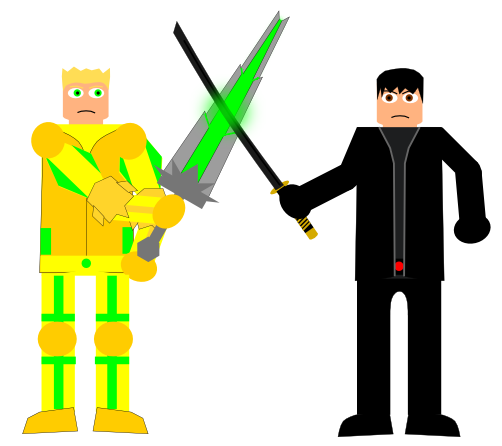 When the door slid opened, Dylan was surprised to see a familiar figure standing ten meters away from them in shining gold armor, a broadsword almost glowing with energy, and the same cannon he had shot Dylan with back at the mines. But evidently Dylan was not as surprised as the Lightor prince. “You couldn't kill me before, and I don't believe you'll destroy me now,” Dylan said in response, waiting for the proper moment to act. “I will destroy you before you destroy my people!” Arthur cried out as he raised his cannon and fired. Trusting his instincts, Dylan threw himself to the side, feeling a searing heat running across his back as he did so. Though the burst of green energy passed a foot away from his body, Dylan suspected it would’ve actually hurt him in some respect, were it not for the energy shield Barre had given him before he left. He made a mental note to thank Barre for the equipment later, perhaps by using his influence as the Shadikill prince to get him the best materials to build himself a cybernetic arm with. Just as Arthur was firing a shot, Dylan whipped out his magnum and fired twice at his arm. One of the shots missed, but the other one struck him square in the wrist, throwing his aim off, and causing his blast to miss Dylan by over two meters. Not wasting a second of time. Dylan fired three more blasterbolts at Arthur, two of them striking his arm and knocking his cannon out of his grasp. As it fell to the ground, Dylan fired several more shots at it, destroying its handle and trigger. Rather than make the futile effort to reclaim his now disabled cannon, the young Lightor prince took up his broadsword in both hands, and twirled it in an elaborate flourish before pulling the blade back, and angling the tip in Dylan’s direction. Eager for a real challenge, and for revenge, Dylan holstered his magnum and drew his own sword from his back. Feelings of anger, anticipation, and interest began to envelope Dylan. This was going to be fun. Both opponents charged at each other at the exact same time, covering the ten meter distance between them in but a couple of seconds. When they reached each other, they both pulled their blades back, and swung at their opponents as hard and as fast as possible. A loud resounding clang split the air as the blades of Dylan’s katana and Arthur’s broadsword struck each other with great force. The sound was like music to Dylan’s ears. As soon as the words had left Dylan’s mouth, Shorya had taken off running towards Vu’s ship. She didn’t like leaving Dylan alone to face the Lightor prince, but she realized it was in both of their best interests to escape this base before more Lightor soldiers realized where they were and came to capture or kill them. And Shorya had no intentions of letting herself or Dylan be captured or killed. Shorya had taken it upon herself to protect Dylan in battle, and she knew Dylan had taken it upon himself to do the same for her. She had been broken and lonely when Dylan had found her, but when they met, Dylan gave her a new home and a new family, and for that she could never thank him enough. And now he had almost died for her, and risked his life to rescue her from this prison. Just as Shorya was almost at the ship, a familiar figure leapt out in front of it. A figure in gleaming white armor, holding a blaster of her own, and her personalized electrostaff. “Did you miss me?” The Lightor girl asked. Shorya groaned. Arthur had never faced an opponent like the Shadikill prince before. Each and every time he tried a new offensive strategy to penetrate his defenses, Dylan adapted almost immediately and seized the advantage, forcing Arthur on the defensive. Dylan was also faster and had quicker reflexes than anybody Arthur had ever faced before. Their duel was an intricate dance, as the momentum shifted between one of them driving the other back, and the other driving them back a few seconds later. Dylan was very cautious, knowing he was not afforded the same advantage that Arthur’s armor gave him. He was actually somewhat impressed by his opponent’s strategic abilities, and frightened. The smarter Dylan was now, the bigger the threat he’d be if he grew up and inherited both of his parents’ positions. Arthur recognized Dylan’s strategy as a simple one, but one that was undeniably effective nevertheless. Dylan would stand on the defensive very cautiously using tight and efficient moves to parry Arthur’s strikes. But while his blade was always ready to meet Arthur’s, Arthur could see him surveying his entire body with his eyes, looking for an opening, waiting for him to overextend himself or react too slowly. Whenever Arthur left an opening, however small, Dylan would seize the advantage, and drive him back with a series of savage slashes and thrusts with his own blade, attacking viciously with a tempered fury. Sometimes, his offensive flurry would begin with lightning quick attacks intended to overwhelm him. Other times his offensive flurry would start out with a power blow to thrust Arthur’s blade to the side, widening whatever small opening Dylan had found before falling into a vicious barrage of jabs at the now larger opening. When this happened, Arthur was forced to fall back on the defensive, sweeping his blade in wide arcs to parry his opponent’s offensive flurries. Every so often however, Dylan’s blade would pierce his guard and score a glancing blow or two, though Arthur’s armor was capable of shrugging these blows off. If Dylan got a more solid blow on him however, Arthur knew he’d be in real trouble. After parrying Dylan’s attacks, Arthur often found it appropriate to take a few steps back to create distance between him and his foe. With the distance created, Arthur would often jab his own blade forward or swing it in an offensive flurry held out away from his body in order to keep his more vulnerable opponent at a safe distance. He would then create a little more distance, charge forwards and try another offensive strategy and set of moves against Dylan. That’s when the cycle would repeat itself. Arthur would be on the offensive, Dylan would almost immediately adapt to his strategy, cautiously and carefully block every single one of his blows. Dylan would spot an opening. Dylan would fly into an offensive, passion fueled flurry. Arthur would be forced to respond with defensive techniques before falling into a retreat, keeping Dylan at a distance with offensive jabs and flurries. Arthur would work up the momentum to re-orchestrate his offense, this time with a different strategy, and Dylan would again adapt to it. It was a cycle that repeated itself over and over again. “You are aware I cannot allow you to leave this base alive correct?” Arthur asked his opponent, carefully trying to gauge his opponent’s own confidence in himself as he pressed the offensive with a series of overhead chops and crosscuts. “It is the way of the Shadikill to only focus on violence rather than virtues,” Arthur responded with a hint of disappointment in his voice as he stepped back, swinging his blade in wide arcs to counter Dylan’s flurry. Shorya dashed back in forth, from behind one ship, to behind another, unleashing barrages of blasterfire from her automatic blaster rifle, before taking cover from whatever blasterfire came from her opponents weapon, if it could be called blasterfire. The last time Shorya had fought this opponent, she had been driving her back into a steady retreat. This time however, it was a chase, and Shorya was on the run. Unlike last time however, Shorya did not have her armor, and thus was more vulnerable than her opponent. This was why Shorya was the one on the run. Because she could not afford to take nearly as much blasterfire as her opponent could, so she had to fight cautiously and carefully, avoiding as much damage as possible. While this strategy kept her alive, there was also one flaw to it. It was drawing the fight out and extending it indefinitely, and Shorya needed to get the ship started so she and Dylan could escape. Suddenly a smile spread out across her lips. Last time we fought she lead me into a trap Shorya thought to herself. Now it’s time for me to return the favor! Shorya swiftly leapt out from behind the ship she had been using as cover and fired off several more blasterbolts in her opponent’s direction, catching her in the chest twice, and in the leg once. Before her opponent could return fire however, Shorya dashed behind the nearest ship. Knowing the Lightor would slowly circle the ship, too clever for Shorya to surprise her by hiding behind a corner, Shorya instead leapt up onto the ship, grabbing the top with her free hand and hoisting herself up upon it. Her body pressed tightly against the top of the ship, she slowly crawled across it to the other side. Without a second to spare, Shorya jumped back up to her feet, took up her automatic blaster in both hands, and rained blasterfire down on her confused opponent from above. Before her opponent could regain her composure and return her blasterfire. Shorya leapt down from the ship, and swiftly threw her leg up in a kick, wrenching her opponent’s blaster out of her hands. In response, her opponent brought her electro-staff around, swinging it hard at Shorya’s blaster and knocking it out of her own hands. When she brought it around for a second strike, Shorya brought her blade around to parry it. The two girls were then locked in a series of lightning quick strikes and parries, neither managing to overcome the other. Then, Shorya began to get angry. This girl was as much responsible for her capture and Dylan being shot as the prince was, and now it was time for her to pay. Shorya let out a loud cry as she flew at her opponent with greater velocity than she had ever thought possible, driving her back with a series of ferocious, but precise stabs and crosscuts. Her opponent fell back under the raw fury of her assault, barely able to meet all of her strikes in time, despite the greater surface area of her weapon. Shorya pressed harder. When her opponent tried to mount a counteroffensive via a wild swing at her, Shorya caught her strike with her own blade, driving it downwards with great precision. Before her opponent could bring the other end of her staff around, Shorya grabbed the handle of the girl’s staff with her free hand. In one single motion, Shorya pressed with her blade, and twisted the hand she had around the staff’s handle, driving the end of it into her opponent’s leg. Her opponent shrieked in pain as Shorya wrenched the staff from her grasp, and swung it around, catching her in the face and sending her body tumbling to the ground. Rather than check whether or not her opponent was still alive or unconscious, Shorya tossed the girl’s weapon to the side and again took off running towards Vu’s ship as fast as her legs could carry her. Dylan fell perfectly into the rhythm of combat with Arthur, expertly parrying Arthur’s offensive, before seizing the advantage and driving him back with a furious assault of his own, sometimes landing several glancing blows on Arthur’s armor before he was able to properly create a safe distance between them. Ever since Arthur’s arrogant monologue about Shadikill ignorance, Dylan had an even greater determination to kill him, attacking with greater passion and furry. His moves picked up speed as he relentlessly hammered away at his opponent’s defenses. Dylan swung his blade at his opponent hard, slamming it into his Arthur’s shoulder as he attempted to twist out of the way. Though Dylan’s blade did not pierce Arthur’s flesh, the entire shoulder plate of his armor completely shattered under the force of Dylan’s blow. Desperately, Arthur fell back into a desperate retreat, taking several steps back under Dylan’s wild frenzy. Dylan let Arthur fall back a few more feet, pausing his assault. He had complimented his opponent on his skills in combat. He would’ve been content to have just left it at that, but after his opponent used his compliment as a way to insult him, Dylan knew he couldn’t leave it at that. Arthur responded by pressing him even harder, this time jabbing the tip of his blade at Dylan’s fingers, which Dylan adapted to by wrapping both hands around the handle of his katana and twirling his blade in circular patterns, slapping Arthur’s blade away before it even had a chance to reach his flesh. As if to prove his point, Dylan swung his blade in from the right, slapping Arthur’s overextended blade to the side, before swinging his blade back in from the left, slamming it into Arthur’s visor with great force. Though Arthur was able to snap his head back in time to save his life, his visor still ended up too cracked to see out of. In an effort to see, Dylan’s opponent removed his helmet, revealing a fair skinned face and bright blond hair. It was Arthur’s eyes that Dylan found the most intriguing. They were a bright green, and the first word Dylan would use to describe them would be piercing. His gaze seemed to stab through everything it was directed at. Dylan almost felt as if Arthur’s eyes were looking straight through his flesh and directly into his soul. His irises seemed to vibrate with an almost electric intensity as his gaze swept back and forth, analyzing Dylan’s posture, his weapon, and his stance. Suddenly, Dylan heard the whir of Vu’s ship starting up. As Dylan’s hateful glare met Arthur’s piercing gaze, a smile spread out across Dylan’s lips. A silent taunt, I have won, you have lost. His opponent flew at him in a wild frenzy, desperate to cut him down before his escape vessel reached him. Dylan glanced up, saw Vu’s ship flying towards him with an open hatch, and knew what he had to do. Focusing back on Arthur, Dylan slashed his blade to the side, disrupting his opponent’s desperate frenzy, before falling into a furious assault of his own. Unlike before, Dylan did not restrain himself this time. Knowing Arthur was unbalanced by his own desperation Dylan practically pounced on him with a series of devastating slashes, crosscuts, and blows, attacking from every angle he could think of with great velocity, driving his opponent back into a desperate retreat. Much like the other times, Arthur swung his blade in a few wide arcs to parry Dylan’s blade before stepping back and jabbing his blade out like a spear to keep Dylan at a distance. “Not this time!” Dylan cried out as he swung his blade in from the left, forcefully redirecting Arthur’s blade to Dylan’s right. As Dylan brought back his blade, he thrusted out his right foot, catching Arthur directly in the abdomen, and sent him doubling over in pain. Out of practicality, Arthur immediately brought his blade up to defend his face, the most vulnerable area of his body, though Dylan’s next strike wasn’t aimed at his face. Pulling back both of his arms, Dylan swung his blade from the his left with all of his might, his blade headed directly towards the right side of Arthur’s body. His blade tore through Arthur’s armor as if it weren’t even there, pierced his bone, and embedded itself deep in his side, almost half way through his body. Arthur cried out in agony. Dylan released the grip his right hand had on his sword, and punched Arthur square in the nose with all of his might, meanwhile pulling his blade out of Arthur with his left. Dylan watched as his opponent dropped his sword and desperately threw himself to Dylan’s right, desperately trying to escape his wrath. Dylan desperately wanted to kill the boy who had almost taken his life, and Shorya’s life. As the single heir to the Lightor throne, Dylan would deal a great wound to the enemies of his people by killing their crown prince. But Dylan was completely out of time. Vu’s shuttle was a second away from reaching him, and several Lightor soldiers suddenly had started to pour out of the entrance to the base. When faced with the choice of saving his own life and escaping with Shorya, and killing an already wounded and defeated opponent, the choice was very clear to him. Turning his back on Arthur, Dylan ran up to the ship that was just now coming in beside him, and dove through the open hatchway.